The controversial Dakota Access Pipeline began shipping oil Thursday after months of protests by nearly 300 tribes created a national movement and drew international attention. The 1,172-mile pipeline is expected to carry 520,000 tons of oil daily from North Dakota to Illinois via South Dakota and Iowa, according to Energy Transfer Partners, the company that developed the pipeline. Protesters, led by the Standing Rock Sioux, have strongly objected to the construction of the pipeline since April 2016, saying that its route under the Missouri River poses a threat to drinking water. The Missouri River is the primary source of water for the 10,000 members of the Standing Rock Sioux tribe, and millions of people, including 29 Native American tribes, live in the Missouri River Basin, an area that crosses 10 states and more than 2,500 square miles in southern Canada. The pipeline was originally planned to operate in Bismarck, North Dakota, but that plan was eliminated after an analysis by the U.S. Army Corps of Engineers showed that route would have crossed more roads, wetlands and what federal pipeline regulators call a “high consequence area,” where a spill would bring significant consequences for the local population, according to the Bismarck Tribune. The Standing Rock Sioux stood against the project, saying the pipeline would desecrate ancestral burial grounds and that they had not been adequately consulted. Between April and December 2016, the protest grew to include hundreds of other tribes and people from around the world who came to the Standing Rock Reservation. The $3.8 billion pipeline has already leaked three times this year, according to the Associated Press. Two leaks occurred in March: 84 gallons on March 3 and 20 gallons on March 5 in North Dakota. The last leak happened in early April spilling 84 gallons in South Dakota. None of these were deemed as significant oil spills by the Pipeline and Hazardous Materials Safety Administration as they were all less than 5 barrels or 210 gallons. “This spill serves as a reminder that it is not a matter of if a pipeline spills, it’s a matter of when a pipeline spills,” Dallas Goldtooth, the Indigenous Environmental Network campaign organizer, said after the April spill. In February, the U.S. Army Corps of Engineers approved the final easement for the pipeline’s construction, and in March, the U.S. Court of Appeals for the District of Columbia Circuit refused to issue an emergency order to stop pipeline operations. 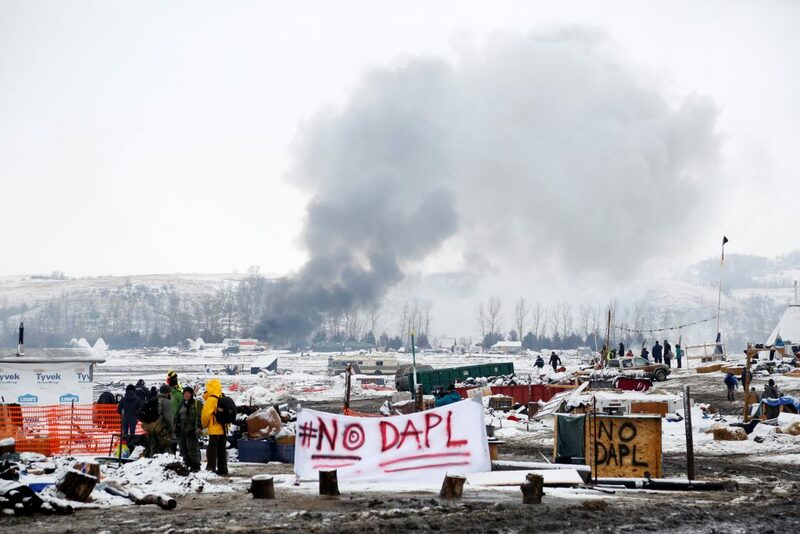 But the Standing Rock Sioux tribe has said it will continue its fight. “We will continue to battle the operation of this pipeline in court and remind everyone that just because the oil is flowing now doesn’t mean that it can’t be stopped,” Standing Rock Sioux Chairman, Dave Archambault II said in a statement Thursday when the pipeline began service.